The Episode starts with Aadhya telling Jai that they are going back home. Jai gets angry on her and thinks I am already tensed about Vihaan and she is not asking me once, and just thinking about herself. Karan takes Aadhya’s bag. Ragini asks Jai not to worry and says they all will take care of Aadhya and asks her to come. Karan says bye and hugs Jai. Jai thinks to talk to Aadhya. Aadhya reaches her house and thinks about their kundalis. Jai comes to Aadhya’s room. Aadhya hugs him and says I was missing you. Jai says even I was missing you. He looks at the kundali which was on table and gets upset. Aadhya says she was not thinking about it. Jai says he is very worried for Vihaan as he never went missing. Aadhya says he is upset, but will return and says he can’t get angry with him for much time. Jai asks really. Aadhya says you have hidden talent and asks him to sit and says she will make something for him. Jai refuses. Aadhya asks him to have bhujiya. Jai says later and rests his head on her lap. Aadhya asks him to sleep. Jai says I am feeling strange and….Aadhya says since Ragini and Karan came here. Jai says yes and says something is wrong for sure and asks Aadhya if she knows them since childhood. He says they have to find out. Just then he sees someone reflection spying on them and tells Aadhya. He runs out. Aadhya is shocked. Jai looks outside and sees the door open. He thinks someone came out from inside and suspects bro-sister duo. Karan says you are here at this time. He asks Ragini to come. Jai closes Aadhya’s window and sit on her bed tensedly. He says I will stay here tonight. In the morning, Diya comes to Aadhya’s room and see them sleeping while sitting and wakes them up. She asks them to wake up else she will tell Papa. She smiles and says she will not tell him. She asks Jai to call Rupa. Rupa asks him to reach office fast. Jai asks Aadhya to get ready for the show. Aadhya goes. In the radio station, Jai and Aadhya start their program. The first caller asks how did he enjoy the trip and tells about seeing his post on social sites. Jai gets emotional and tells that his best friend is missing and tells that he never left me, but now he is not talking to me. He gets teary eyes while speaking about Vihaan. He says he was not only my best friend, but I call him my lugayi (wife). He asks Vihaan to return home fast else he will beat him badly. He asks him to come and says I am waiting. Aadhya says Jai and Vihaan have a special relationship and plays a song dedicating to their friendship. Jai says I am really worried for him. Aadhya says he will come and asks not to worry. Dadu calls Jai and says Vihaan….worriedly. Jai says I am coming there. Jai and Aadhya rush home and see Vihaan in extremely bad condition. He asks who did this and asks him to tell his name. Vihaan points his finger at Karan. Jai slaps him and asks how dare you? He says who are you? Ragini asks him to listen and says Karan didn’t beat him, but saved him. She asks are you a goon? Jai asks Vihaan to say. Vihaan says Karan has saved me and is not guilty. He tells that he fell in the valley and then he got consciousness in the jungle. Some goons attacked him, but Karan saved him. Ragini says why you all are negative and says such things happen daily, and says Vihaan is alive, many people die. Karan looks angrily. She asks him to come. Aadhya says sorry to Karan. Jai comes and says him sorry. Ragini says you have many anger issues and asks what do you think that we will listen to you always. Aadhya says sorry on Jai’s behalf. Ragini says we stayed here for Shubhankar, as he told about the alliance. Karan asks Aadhya to say sorry to Shubhankar and says I can’t fulfil my promise for the first time. Now I have to leave from here. He eyes Aadhya. Vihaan is hiding behind the door and looks scared by the duo. They leave. Aadhya scolds Jai and says what I will tell Papa now. Vihaan asks did they go surely. Jai and Aadhya say yes. They take him to room. Vihaan is relieved. Aadhya says you should have listened first and says Karan was innocent. Jai says what wrong did I do? He asks Vihaan to have water. He sees Aadhya having a mark on her hand and asks her. Aadhya is silent. Jai recalls pushing her and feels bad to hurt her. Karan is outside and thinks you don’t know what dangerous storm will come in your life. Precap: Jai sees Ragini unconscious in the temple and helps her get up. She hugs him. Jai asks her to relax. Karan takes their pics and makes it viral. Aadhya is shocked and thinks this can’t happen. Karan talks to someone and says everything is happening as planned. The man tells that Jai Mittal will be ruined. 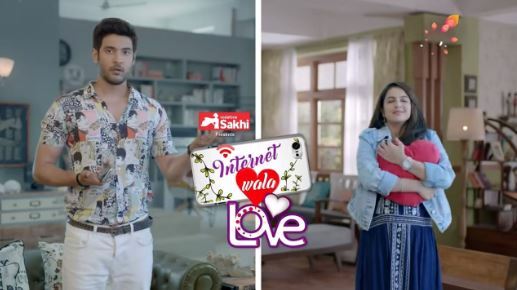 The post Internet Wala Love 20th February 2019 Written Episode Update: Karan and Ragini execute a big conspiracy to separate Aadhya-Jai appeared first on Telly Updates.